Creating performance like this doesn’t just happen overnight, it is a process that takes patience, precision and time, resulting in the unique features that make every Viking look, feel, and play like no other cue in the world. Born of innovative design, the pure science of wood and legendary craftsmanship, Viking performance shafts exemplify the meaning of precision and accuracy. The Viking eXactShot®, ViKORE®, and the VPRO® shafts are dominating performers. The other guys charge up to $125 to add a quick release. Here at Viking the Viking Cue Quick Release Joint is standard on all Viking Cues and greatly reduces the time and effort required to connect two piece cues. 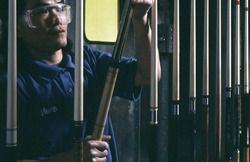 Every Viking Cue undergoes a meticulous 27-step finishing process and includes the application of many layers of Viking UV finish which, between coats, is painstakingly sanded by hand to give our cues the “glass‑like” appearance that Viking is known for. Whether you select our 100% Double Pressed Irish Linen Wrap or choose a luxurious leather for your cue, all Viking wraps are professionally applied and will provide flawless performance year after year. Using the Viking Precision Weight Bolt System, you can achieve perfect balance and finetune your cue with our unique stackable weights. The Viking Precision Weight Bolt System is standard on all Viking Cues. The taper of a shaft should fit a player’s shooting style and skill level. All Viking cues come standard with 12-14” pro taper which gives all our shafts natural low-deflecting properties. Other tapers available. Exclusively designed, tested and manufactured inside Viking Cue, our indestructible SUPER ferrule exceeds every quality standard with over a quarter million in play and not one cracked ferrule. Designed, tested and machine cut on our state-of-the-art CNC lathes, every one of our joints are made for dead-on accuracy, every time. Viking offers 15 vibrant colors of stain that will enhance the natural grains found in each of our woods. Each beautiful grain-enhancing stain is carefully hand-applied by a Viking craftsman. Choose from all the exotic woods, stones, stains, shells, and premium pearls we have to offer. Don’t forget, you can also choose your tip, taper, and weight on ANY Viking Cue. 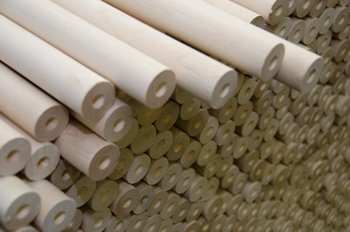 Viking UV finish encapsulates the wood and protects your cue from the elements. Viking UV is not only beautiful, it is tough and made to last. The Viking rubber bumper has a minimalist profile, protects, and “stays put” because it is threaded and will never fall out. 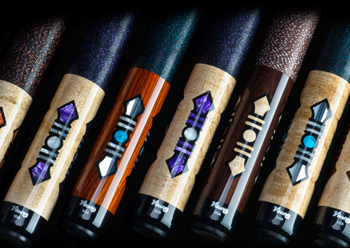 CLick on the white dots to view some of the special features hidden inside every viking cue.